Our 7th annual Labor of Love Music Fest will be during Labor Day weekend, on Saturday, August 31, 2019 at Bolsa Chica State Beach, from 11am to 5pm. Our mission is to be an outreach to the community, by providing a Free event that families can enjoy great contemporary Christian live music, delicious food, rides and activities for kids, raffle giveaways, and where businesses like yours can provide goods and services the community needs. Last year our event was a great success with an estimated 10,000 attendees throughout the day. Furthermore, we sold out on our nearly 100 vendor display booths. 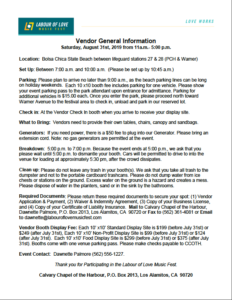 We have a limited amount of available vendor display booths, due to the fact that we have many returning vendors. On May 1st we will begin accepting new vendor applications. 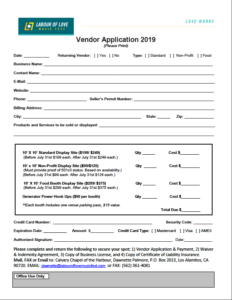 To apply for a spot, please fill out and return your 1) Vendor Application, 2) Indemnity Agreement, 3) Business License and 4) Current Certificate of Liability Insurance (if applicable), with your payment beginning April 15th. Spots will be assigned on a first come basis. Please note that booth fees go towards covering the cost of the venue. 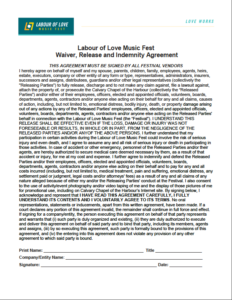 Labour of Love Music Fest is a not-for-profit event for Calvary Chapel of the Harbour. Please click on the links below that provide general information about having a display booth, as well as what is needed to register and attend. If you have any questions regarding the event, please contact Dawnette Palmore via the information below.